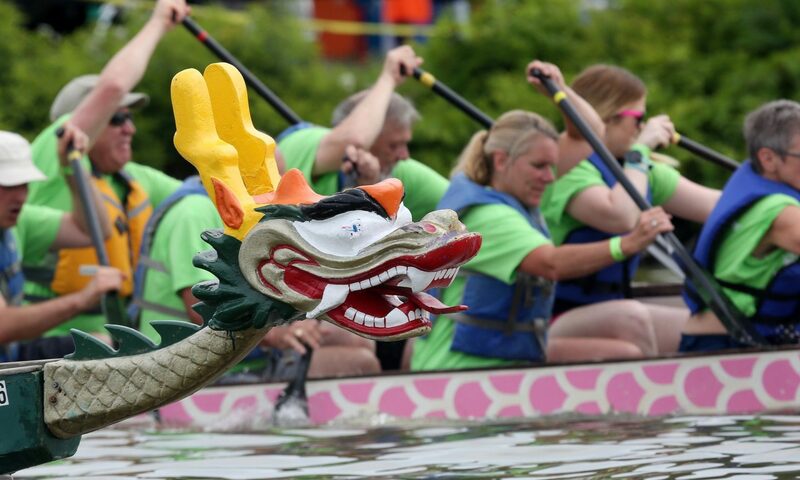 The Dutchess Dragon Boat Race & Festival first came to Poughkeepsie in the summer of 2014. Community members Peter Van Aken and Bob Creedon come to Dutchess Tourism and formed a committee with Miles of Hope Breast Cancer Foundation and Arts Mid-Hudson. Thus, formed the vision of bringing dragon boat races back to the Hudson River in Poughkeepsie. A few years earlier, Peekskill had been the event’s venue. Since then, each subsequent year, the event grew and became more famous. Through a lot of hard work, it has become a wonderful event to showcase Poughkeepsie’s beautiful Hudson River waterfront and raise funds for important, and local, non-profit organizations. For the first years of the Dutchess Dragon Boat Race & Festival, proceeds went to the local chapter of Miles of Hope Breast Cancer Foundation and Arts Mid-Hudson. For the 2017 event, the baton has been handed to Habitat for Humanity of Dutchess County to host the event. While keeping all the momentum and excitement going, the dedicated folks at Habitat Dutchess are eager to continue the tradition of the Dragon Boat Races. This time, however, proceeds will go straight to their mission of building strength, stability and self-reliance through homeownership right here in Dutchess County. With 5 new homes in only 4 years, Habitat Dutchess is working to end poverty housing one family at a time. This event promises to be a great opportunity to showcase Habitat’s mission, raise funds, and increase community awareness of the organization. In Southern China over 2,300 years ago, Qu Yuan, a poet and advisor to the Emperor, was exiled from the Kingdom of Chu because of disfavor with his advice to the ruling class. In 278 B.C., upset at the direction the rulers were taking, Qu Yuan took a large heavy rock, threw himself in the Miluo River and drowned. The local fishermen rushed out to the middle of the river in their long boats, beating drums and splashing the surface of the water to scare the fish away so they wouldn’t eat Qu Yuan’s body. They also scattered rice to distract the fish and keep them away from their beloved hero, and this custom evolved today into “Zhongzi” (rice dumplings) which are featured in a Chinese festival called Duanwu (Double Fifth), held on the fifth day of the fifth month of the lunar calendar (usually early in June), the anniversary of Qu Yuan’s death, which is now a Chinese national holiday. Even earlier in Chinese history, decorated dragon boats were used for ceremonial purposes to ward off disease and problems associated with the coming heat and humidity of summer. The “modern” era of dragon boating really took off in 1976, with the beginning of international dragon boat races in Hong Kong. The first U.S. festival started in Boston in 1979, and a donation of three dragon boats from Singapore was given to the city of San Diego in 1983. A race was held to send a team to an international competition in Singapore the following year. Today, over a hundred cities across the U.S. host dragon boat races — and now it has come to Poughkeepsie! A 40-foot-long “canoe”, 4 feet wide, made of fiberglass, with a carved painted dragon head on the front, a wooden tail on the back, and the hull of the boat is painted with dragon scales. 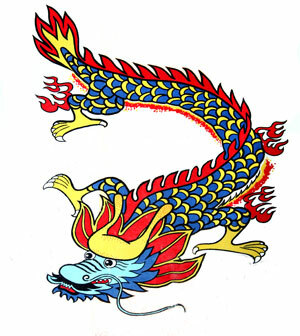 The paddles used by the participants symbolically represent the claws of a dragon. Boats can hold up to 20 paddlers, a drummer and steerer. Each team for our festival consists of 16 seated paddlers, side by side, eight rows deep, holding a single-blade fiberglass or wooden paddle over their side of the boat; a drummer, seated facing the paddlers, who rhythmically bangs on a wooden drum and shouts out encouragement and rhythm to the paddlers; and a steerer, supplied by the organizers, who stands in the back, facing in the direction of the race, and guides the boat straight down the course with a single wooden rudder.